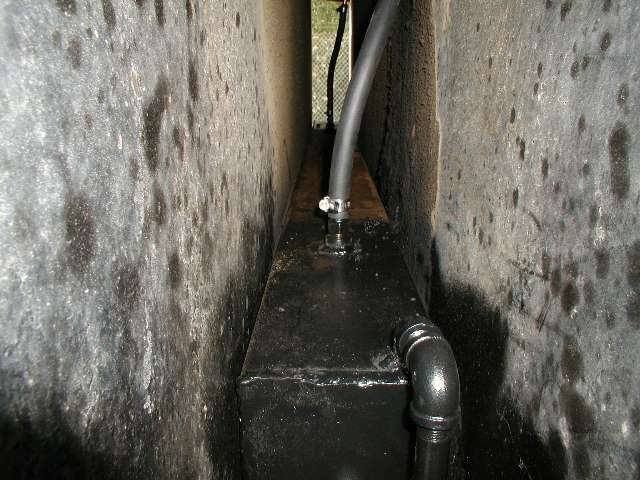 One of several items that was not undertaken before departure from Oakland was the construction and installation of an air box drain tank. This tank is used to contain the lubricating oil that naturally drains from the air boxes on the EMD engine. 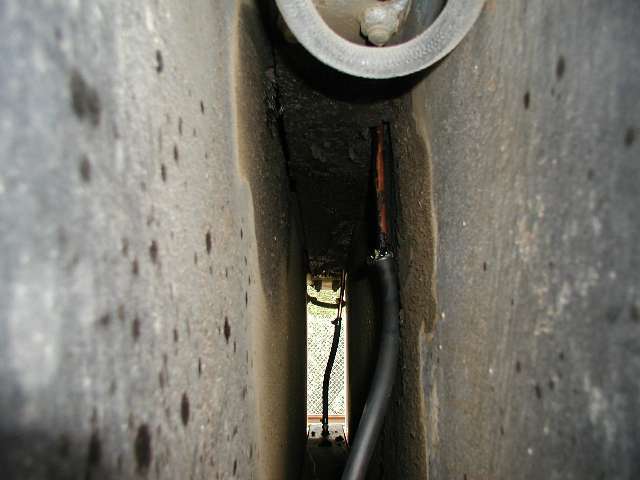 There is a drain pipe on each side of the block which goes down between the fuel tanks and simply dumps on the ground. Needless to say, this can make quite a mess and would really stain the nice boarding platforms at the Sunol Station. Johnathon Kruger used his welding talents to construct the tank and with the able assistance of David Loyola, installed it on Saturday 2/29. 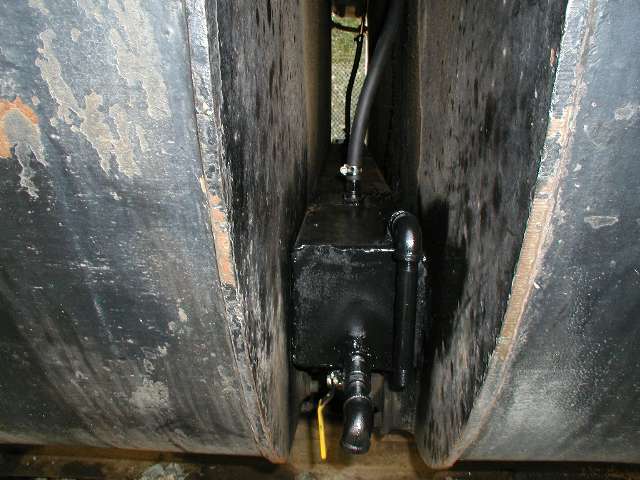 The tank lies between the 2 fuel tanks and is mounted on a couple of tabs that are bolted to the fuel crossover pipes. Fortunately, Johnathon came up with the mounting scheme which involved no welding down there near the fuel tanks. 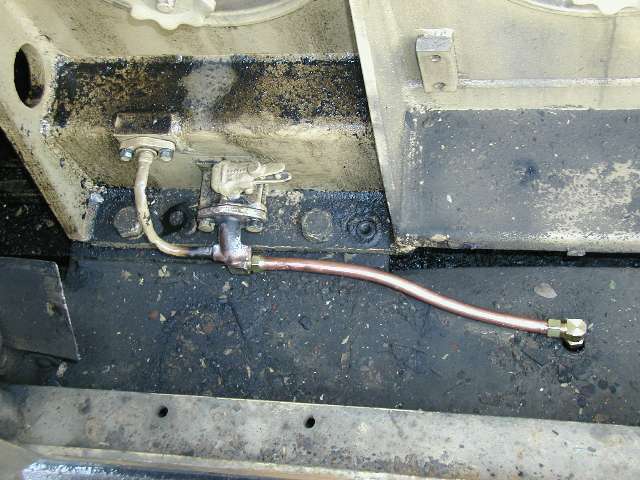 Johnathon put a drain valve and overflow pipe on the fireman's side of the locomotive which will allow us to easily drain and dispose of the unwanted oil. I removed all the piping from the existing drain lines and Errol brazed in some new 5/8" copper tubing compression fittings to the old drain valve assembly. New copper tubing was cut and formed to run from the drain to 90 degree fittings that direct the drain down through the frame. 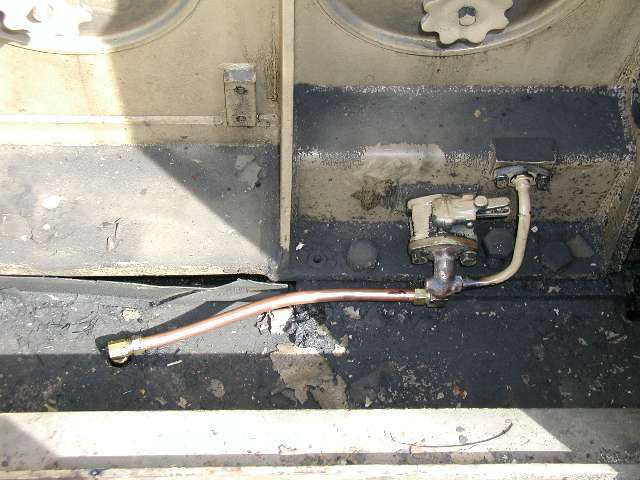 From there, it is a copper tubing and rubber hose run to the fittings on the catch tank. All in all, it makes for a nice, compact, unobtrusive installation. On a funny side note, when we brought the 5472 to the canyon, we decided to close the valves when putting the unit on display in Sunol. I found that I could not turn the valve on the engineers side so assumed that it was frozen open. When taking the piping apart, I found that rather than being frozen, the valve was simply installed backwards. I guess stuff happens, even on the S.P.